Before Heathrow opens its doors to welcome passengers to its newest terminal, Terminal 2: The Queen’s Terminal, in June 2014, they are running nearly 200 trials to check that everything works exactly as it should. Creative Triangle have been tasked with the role of creating the communications to attract the airport community to volunteer to take part in these proving trials. The volunteer recruitment campaign includes a series of posters, direct mailers and newsletters. Heathrow’s target is to have 14,000 people volunteer and our job is to not only help recruit these volunteers but also to engage with them, create excitement and build rapport. We are thrilled to have recently starting working with the University of Warwick and have just completed our first project for them. The University of Warwick tasked Creative Triangle with the development of a visual device for their new Centre of Professional Education, this had to compliment and work within the University’s existing identity. The visual device needed to firmly position the Centre as a department of the University of Warwick, the design needed to be clean, fresh, understated and modern and the solution needed to be accessible both online and offline. So far the visual device has been applied to email banners with plans to roll out the look and feel on all marketing collateral for the Centre. And we have just been awarded our second project for the University – a complimentary visual device for the Centre of Education Studies. 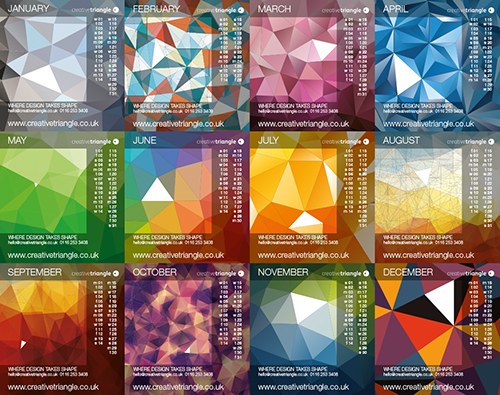 Happy 2014 – we hope you enjoy our shapely, colourful desk calendars this year! (If anyone didn’t receive one and would like one then please let us know).